The Agilent 8164A Lightwave Measurement System is a powerful testing device for optical applications. The Agilent 8164A is an integral testing device for any modern laboratory and its indispensability stems from its power, versatility, stability, and compatibility with a host of other systems. A discussion of the specific features of this device will help you appreciate its uniqueness. The Agilent 8164A is a modular mainframe system that can host one high-end back-loadable tunable laser source from Agilent. This allows the device to carry out spectral measurement of optical products and also measure wavelength dependence. The 8164A also has four slots for front-loadable compact modules. More specifically, these four slots can host single and dual power sensors, compact tunable lasers or fixed wavelength laser sources, DFB source modules, return loss modules, interface modules designed for optical heads, optical switch modules, and even attenuator modules. 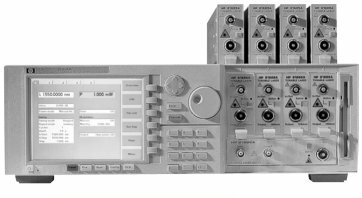 The compatibility of the Agilent 8164A with such a diverse range of systems makes the former an integral addition to any R&D and testing environment because it can be easily configured to serve the needs of a host of diverse applications like insertion loss measurement, dispersion, and determination of polarization dependent loss. Also the plug-and-play mode of the device provides added flexibility and compatibility that is so needed to excel in today’s dynamic and competitive optical components market. Additionally, the Agilent 8164A features LAN and GPIB ports that enable remote control connectivity and thus makes this testing device suitable for system automation purposes using Agilent’s software library. This in turn, reduces the cost of integration into existing test systems, improves yield, facilitates large-scale production, and thus increases the return on instrument investment. 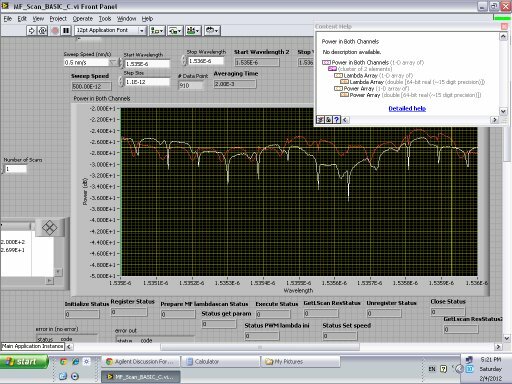 The Agilent 8164A comes packaged with a few in-built applications that that let you perform passive component testing on connectorized or pigtailed devices across a large spectrum of wavelengths; monitor the long-term power stability of a specific device under test; and carry out comprehensive statistical analyses of power readings. The Agilent 8614A offers supreme ease-of-use and convenience with its large and bright LCD screen, an intuitive IEEE-488 interface, and a 3.5 inch floppy drive that lets you store the data readings for future use. The workings of the 8164A are easy to master even for someone who has not worked with lightwave measurement systems before. Today’s digital world demands stable, lightning fast, and crystal clear communication links that facilitate the functioning of superior wireless computing and mobile phone applications and high-quality video and voice data exchanges. There is an increased demand for multi-play networks and optical devices that power these networks have to constantly keep up with these dynamic needs. The Agilent 8164A Lightwave Measurement System lets you perform precise measurements that in turn, optimize development cycles and increase yield and throughput. You can thus reduce the cost of developing, installing, and maintaining optical equipment and network components. In a world of high-speed communication and computation, a refurbished Agilent 8164A optical testing device allows you to score an edge over the competition with improved performance and reduced costs.